The genuine RITMSCENAR devices and ULM Blankets » BACK PAIN AND SCENAR – PREHOSPITAL PAIN RELIEF. MULTICENTER COMPARATIVE STUDY. 4) involves development of non-drug therapies to relieve pain that could be administered by medical specialists, as well as by patients. We suggested to use SCENAR device (Self Controlled Electro Neuro Adaptive Regulator) as an alternative or complementary pain relief therapy. The device generates high-voltage bipolar pulse current without dc component on the principle of the biotechnical feedback. Trial objective – introduce and perform a comparative study on how SCENAR monotherapy can help prehospital patients suffering pains in cervical, thoracic and lumbar spine regions in acute and subacute conditions, as well as in exacerbations of the chronic back pain. Materials and methods. We used the CHANS-SCENAR-02 device manufactured by RITM OKB ZAO and spaced plate electrodes (16 cm2) . 415 patients participated in the study (95 men and 320 women), age 30-80 years, 240 of them received SCENAR therapy. We matched patients by age and gender, duration of the disease, and how long the emergen-cy team was at the patient on call. Commonly pains were severe and of acute nature, so the patients called the emergency. The radiation of pain was various. Evaluation methods – visual analogue scale. The trial was randomized and unmasked. Ex-clusion criteria for SCENAR therapy were contraindications in the User’s Manual, i.e. individual intolerance (hypersensitization), heart pacemaker, severe mental diseases, acute infectious diseases of unknown origin, and fibrillation criterion added in the study. Patients gave verbal consent for the therapy. Exclusion criteria for the drugs were contraindications in the instructions for use. To select patients, evaluate their state and assess dynamics after the treatment we used spe-cific protocols. Group 1 – SCENAR (spaced electrodes, n=28); placing and moving the electrodes on the skin according to the pattern for 10-15 minutes, cervical zone, modulation 3:1, stimulation energy individual, frequency 90 Hz. Group 2 – SCENAR (built-in device electrode, n=62); subjectively dosed mode, cervical zone and painful zone, 15-20 minutes, stimulation energy individual, frequency 90 Hz. Group 3 (control) – baralgin – 5 ml (metamizole sodium – 2,5 g) i.m., (n=22). Group 4 (control) – ketorolac tromethamine 2 ml (30 mg) i.m., (n=23). Group 5 (control) – ketoprofen 2 ml (100 mg) i.m., (n=31). Group 1 – SCENAR (built-in device electrode, n=49); subjectively dosed mode, thoracic zone and pain projection, 15-20 minutes, stimulation energy individual, frequency 90 Hz. Group 2 (control) – ketoprofen 2 ml (100 mg) i.m., (n=52). Group 1 – SCENAR (spaced electrodes, n=31); placing and moving the electrodes on the skin according to the pattern for 10-15 minutes, lumbar zone, modulation 3:1, stimulation energy individual, frequency 90 Hz. Group 2 – SCENAR (built-in device electrode, n=70); subjectively dosed mode, lumbar zone and pain projection, 15-20 minutes, stimulation energy individual, frequency 90 Hz. Group 3 (control) – baralgin – 5 ml (metamizole sodium – 2,5 g) i.m., (n=24). Group 4 (control) – ketorolac tromethamine 2 ml (30 mg) i.m., (n=25). Group 5 (control) – ketoprofen 2 ml (100 mg) i.m., (n=54). Statistical processing of the results was performed by the independent researcher using the Student’s t-criterion and Mann-Whitney criterion. The report provides only treatment results of subjective pain assessment. Fig. 1 shows data on cervical pain management. For better comparison they are calculated in percent in relation to the parameters before the treatment. Using the visual analogue scale patients scored their state before treatment from 4 to 7 points. Fig.1. Pain relief dynamics in visual analogue scale (% of the initial level) of prehospital pa-tients suffering pains in cervical spine region, * – ?<0,05. Figure 1? 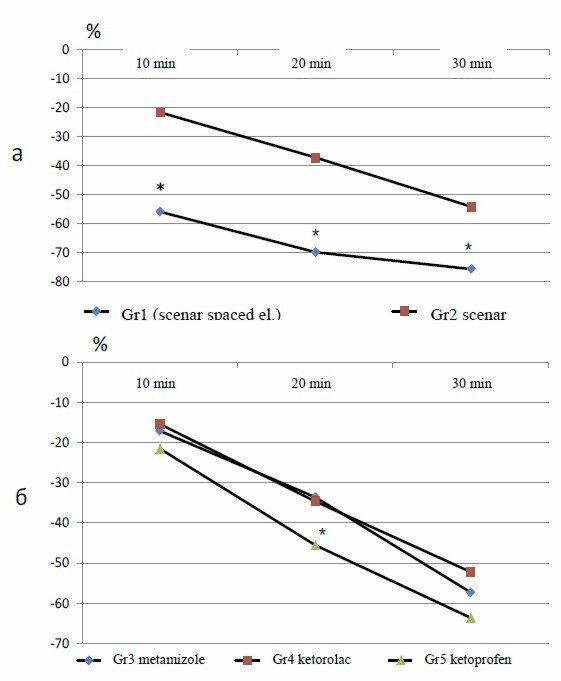 shows that most effective SCENAR was with spaced electrodes, 20-30% greater then stimulation with the built-in electrode, and by 30th minute after the treatment session was 75,7% of the initial level. We suppose the effect is achieved due to greater area of the electrodes and two-side stimulation in the modulation mode of the spastic cervical muscles. Figure 1b shows that the pain relief effect of SCENAR with the built-in electrode by 30th minute after the treatment session was similar to the effect of three analgetics – metamizole sodium, ketorolac, and ketoprofen – in standard dosage. Among all three drugs, ketoprofen was most effec-tive (63.6%). Still SCENAR stimulation with spaced electrodes was more effective than drugs. Figure 2 shows results of treating thoracic spine region. This region of the spine is the most problematic in the differential diagnostics. The patient may have the disease of the spinal column or internals, ischemic heart disease, and all that may cause reflective pain in that region of the spine. We made ECG to all the patients suffering pain in the thoracic region. The aim of the emergency doctor in such a case is to relieve pain, in an appropriate and safe manner, and do not overlook any other serious disease. Fig.2. Pain relief dynamics in visual analogue scale (% of the initial level) of prehospital pa-tients suffering pains in thoracic spine region, * – ?<0,05. 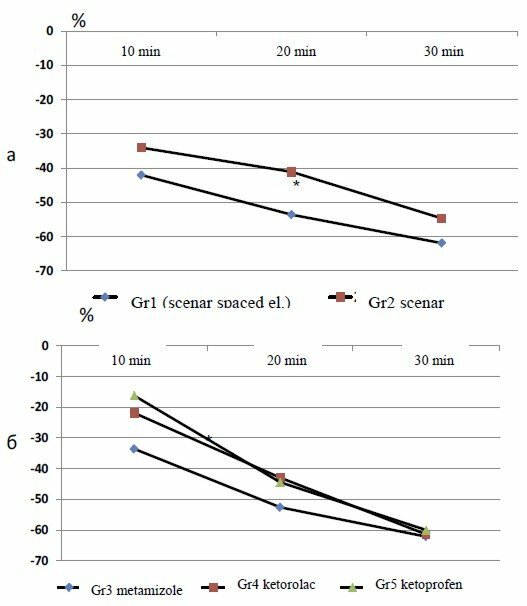 Figure 2 shows that the pain relief effect of SCENAR already in 10 minutes after the treat-ment session was greater than that of the ketoprofen by 39.5%, and by 12% at 30th minute after the session. The data are statistically valid. Figure 3 shows treatment results for lumbar region. The upper figure (a) displays the com-parison of SCENAR effect with spaced and built-in electrodes. The effect of spaced-electrode-stimulation was significantly higher only by 20th minute after the treatment, 53,6% vs. 41,1%. In general, such treatment techniques tended to be more effective. The effect of inbuilt-electrode-stimulation was completely similar to that of the drug thera-pies (Fig. 3b). Fig.3. Pain relief dynamics in visual analogue scale (% of the initial level) of prehospital pa-tients suffering pains in lumbar spine region, * – ?<0,05. The results of our study show that SCENAR monotherapy for patients that had to call the emergency suffering pains in cervical, thoracic and lumbar spine regions is an appropriate real-time pain relief therapy. SCENAR non-drug therapy could be an alternative for patients that have contra-indications for analgetics (allergic reactions, possible side effects, hard-to-get medications, etc.). No side effects or patiets’ refusal from SCENAR observed. SCENAR-therapy contributed to normali-zation of blood pressure, pulse, and breathing rate in most patients. This therapy is easy-to-use, fast-acting for pain relieving, has almost no absolute contraindications, including cancer diseases al-ready diagnosed and only suspected. All that makes this type of pain relief therapy a very prospec-tive for emergency and first aid. 1. For patients suffering pains in the cervical spine region most effective therapy is SCE-NAR stimulation with spaced electrodes. 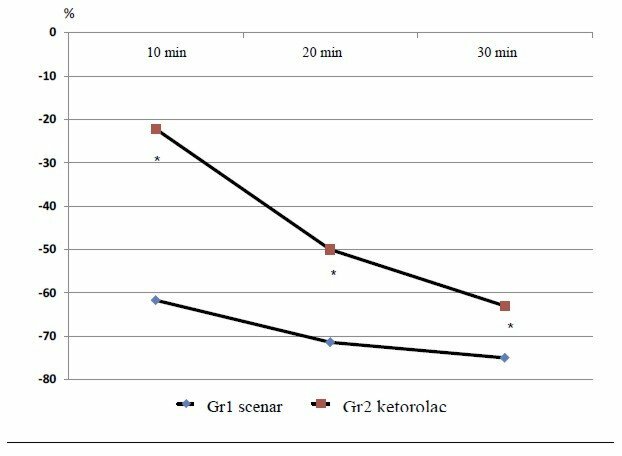 Pain relief effect of SCENAR with built-in electrode is similar to the effect analgetics – metamizole sodium, ketorolac, and ketoprofen – in common dos-age. 2. For patients suffering pains in the thoracic spine region SCENAR with built-in electrode is more effective than ketoprofen. 3. For patients suffering pains in the lumbar spine region spaced-electrode-stimulation tend-ed to be more effective. The effect of both techniques of SCENAR stimulation is similar to the ef-fect from analgetics (metamizole sodium, ketorolac, and ketoprofen in common dosage). 4. SCENAR is an appropriate and safe pain relief therapy for patients suffering back pain.